This past Friday my wife and I were invited by a friend to come to the soft opening of her new business. She had once been in a Corporate Wellness role, but recently was affected by a downsizing. This is never easy. To be between jobs is challenging for anyone. She reflected on what her next step should be, and after some time and talking with her husband she decided to open a Pinot’s Palette franchise !! These stores are where you can go and paint your own masterpiece with friends and family or on your own. That’s a giant step for anyone. To make the move from a role where you’re part of a larger organization where you have co-workers and resources to becoming an entrepreneur takes faith. I wanted to make sure to be a supporter of her new endeavor, so we attended the opening. Now, we honestly thought we’d come to congratulate her and share a drink and some finger food. We’d take a tour of her new place, meet her husband and wish them the best. However, as we opened the door we were greeted with life, upbeat music and MANY friendly faces. We looked over at the tables and there were 40 small easels all with a blank canvas on them. I thought that was a good representation of what a normal night would look at the business. One of the new staff said, “Pick out an apron from the wall. We have a space marked out for both of you.” My wife and I looked at each other and then back at the staff member. I said, “I’m sorry. We’re supposed to grab an apron?” She replied, “Well, yes. You’re going to paint tonight !! We’re all doing Van Gogh’s The Starry Night.” We were caught off guard. We grabbed an apron, moved to our places and stared at a blank canvas in front of us. My wife had never gone to a painting class, and I had only been once. As the room filled up, you could hear most of the people who were associated with the new owners share their same anxiety about what was about to occur. Before we started, we both shared some food and a drink hoping it would calm our nerves. We also introduced ourselves to our table mates. The instructor asked us to take our places and get ready to paint. My wife leaned over to me and quietly shared, “I’m not sure I can do this.” I reassured her that she’d be fine, and then the painting began . . .
Let me break away for a second. My wife’s response in facing a blank canvas is very similar to most people I know. We don’t like the unknown. When faced with a task that seems daunting and beyond our capability, we doubt ourselves. It’s how many face work daily and keep their anxiety to themselves. Are you there to reassure others that they are capable? You have a great opportunity in HR to be an encourager on a daily basis. I wish more HR practitioners would do this. 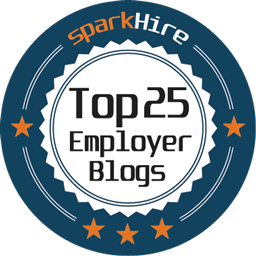 Employees yearn for acknowledgement and someone who believes in them. I hope you willingly step into that role. Now back to painting . . .
Layer after layer was added to our canvases. What started as several brush strokes of deep blue paint now took form and started to look like a landscape. The conversations that people had ranged from people in awe they could paint to inevitable comparisons. Everyone stated that their painting wasn’t good enough. 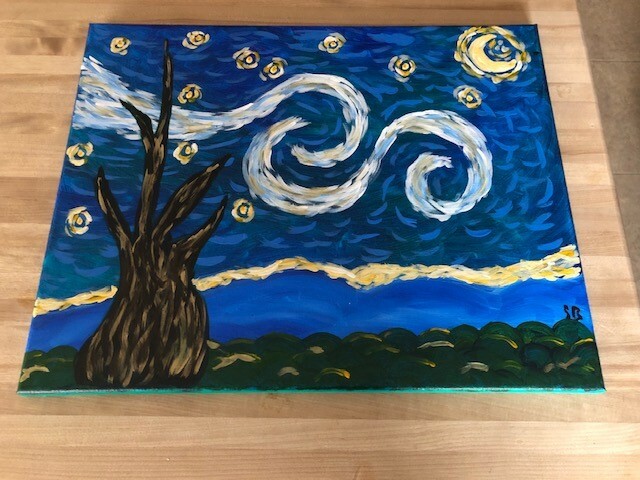 They didn’t look anything like Van Gogh’s work. Back to employees and workplaces . . . Sounds just like work doesn’t it? Instead of being encouraged for the performance people give through their effort, we compare. We have entire systems which measure what people don’t do and how they fall short. How backwards is this? And yet, we do nothing to eliminate this archaic and ineffective approach. We can, and should, change our approach to focus on the work that people do and expect them to be creative and perform. Workplaces would thrive if this became the norm and not the exception. And now we finish . . .
My final piece of art !! Had a great time doing this. You can treat every day as a blank canvas because it is. Instead of doubting your ability, pick up a brush, dab some paint on it and start covering the white space. You can also be someone who adds color, life and vibrancy to other’s and their blank canvas. Do this on purpose and see how much better you enjoy your work, HR in general and the amazing accomplishments of others. Previous Previous post: Take Your Shot !! Next Next post: Write. Read. Share.